It is impossible to answer the question Which Came First the Art or the Loco. The Weirdness I have been documenting in San Miguel is everywhere. Here are two Locos in Santa Fe. Where there is Art there are Locos. Where there are Locos there is Art. This is my 146th day in San Miguel and it is feeling a bit like the TV show LOST. I am having a bit of a problem understanding why can’t Art and Three Piece Suits go together or a single strand of Pearls and Art. Why does there have to be Berets, Capes, ripped stockings, multicoloured articles of clothing? Why do artists have to go over the top? I am beginning to understand why Catholic and Private Schools have dress codes. But then I wouldn’t have a blog if Artists didn’t go over the top, would I? As Emily Litella said “Never Mind”. Another post to fill the hours. Post Number Two – Same Picture. 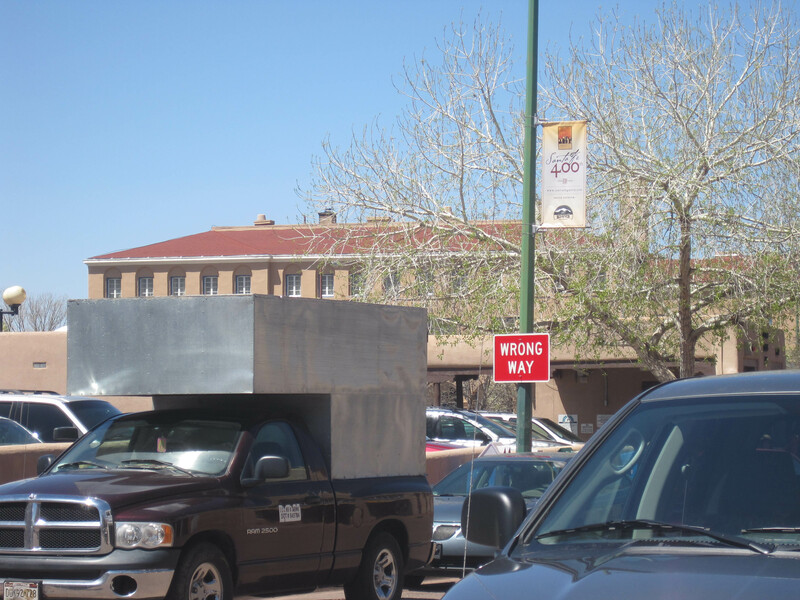 As a previous post commented, Signs in Santa Fe are there for a reason. These woman should have read the sign and Stopped Dressing like that. 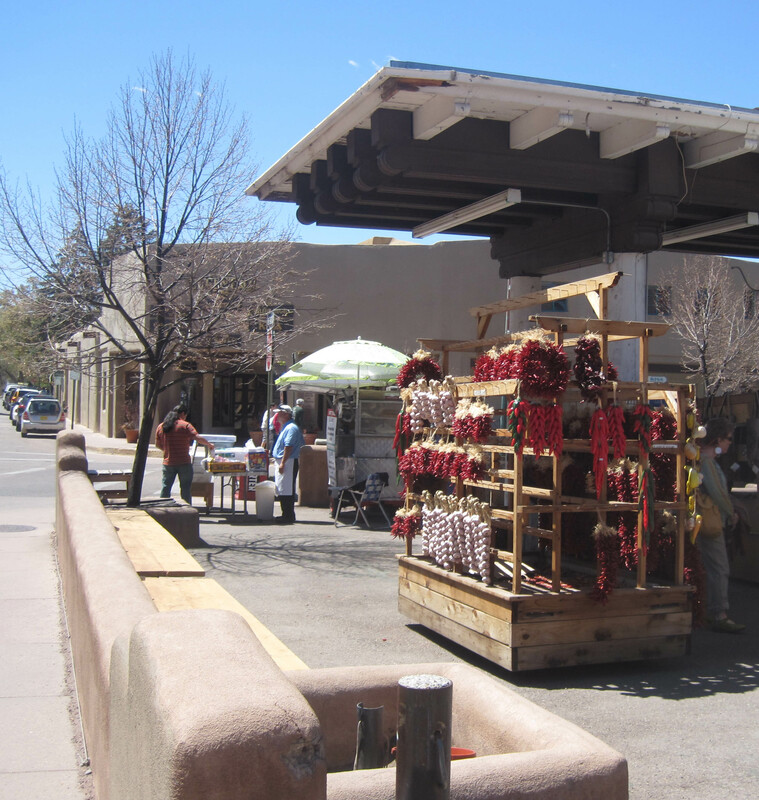 Santa Fe is far more helpful to residents than San Miguel. I found these signs all over Santa Fe. 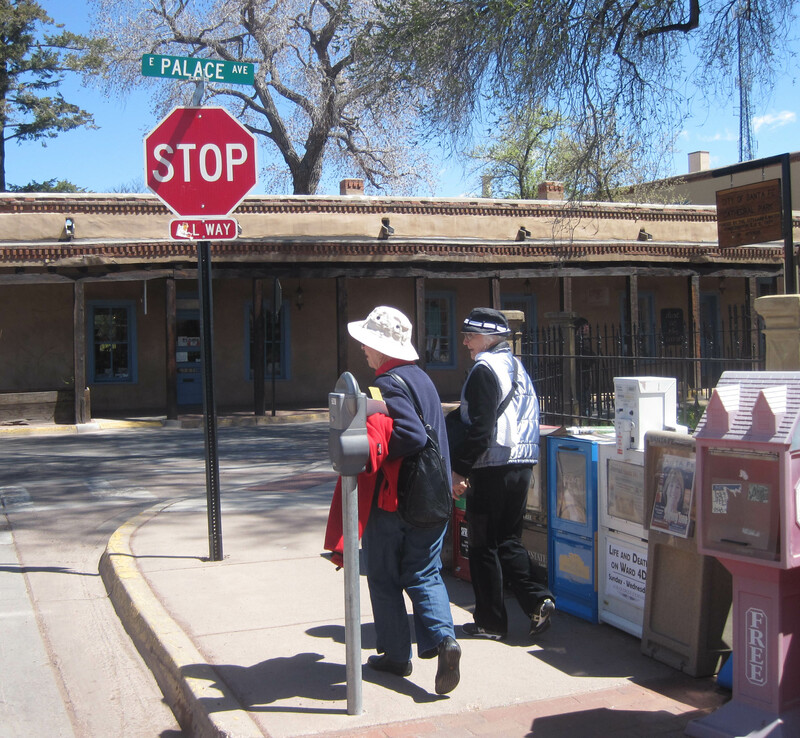 Below the sign is a little box containing a pamphlet containing an explanation of what is the Wrong Way in Santa Fe. Suggestions are offered to residents and would be residents of what is considered the Wrong Way in Santa Fe. 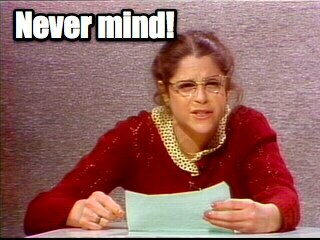 My favorite was the Wrong Way stop that talked about Sarah Palin and how she was the Wrong Way. The idea must have come from those Exercise Stations you see in Parks. 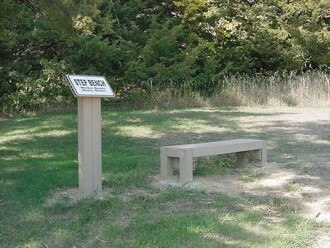 Each stop, has a sign either telling you or showing what you should do at this part of the Exercise Trail. Now stop and think how helpful these would be in San Miguel sort of like Stations of the Art Walk. 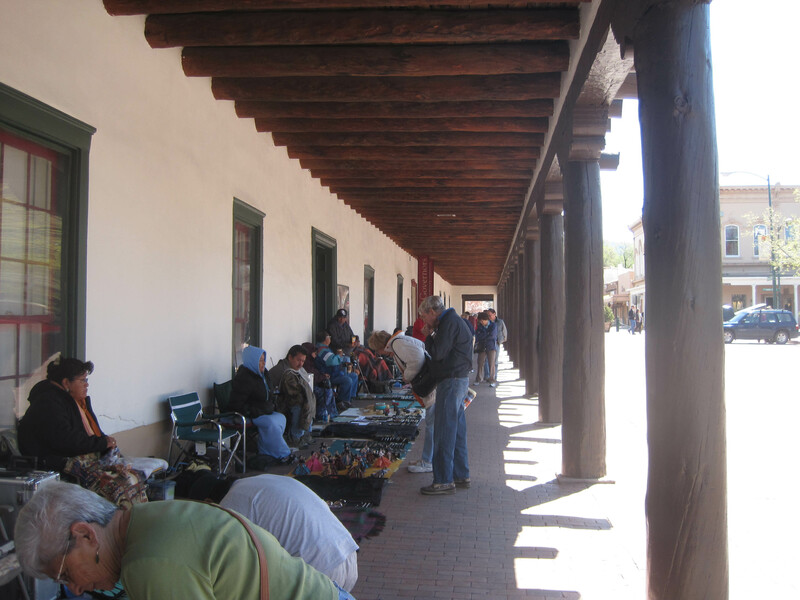 New arrived residents go out the Art Walk area and learn how to be better citizens of San Miguel. 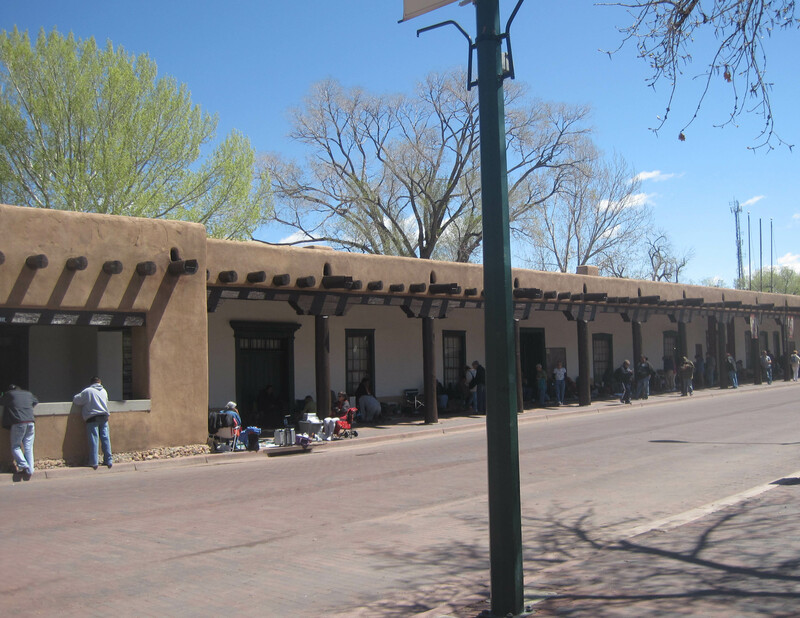 Once I turned the corner I had my Ah Ah Moment and understood the connection between Santa Fe and San Miguel. The common link is not the Mexican/Spanish connection but the love of Real Estate. 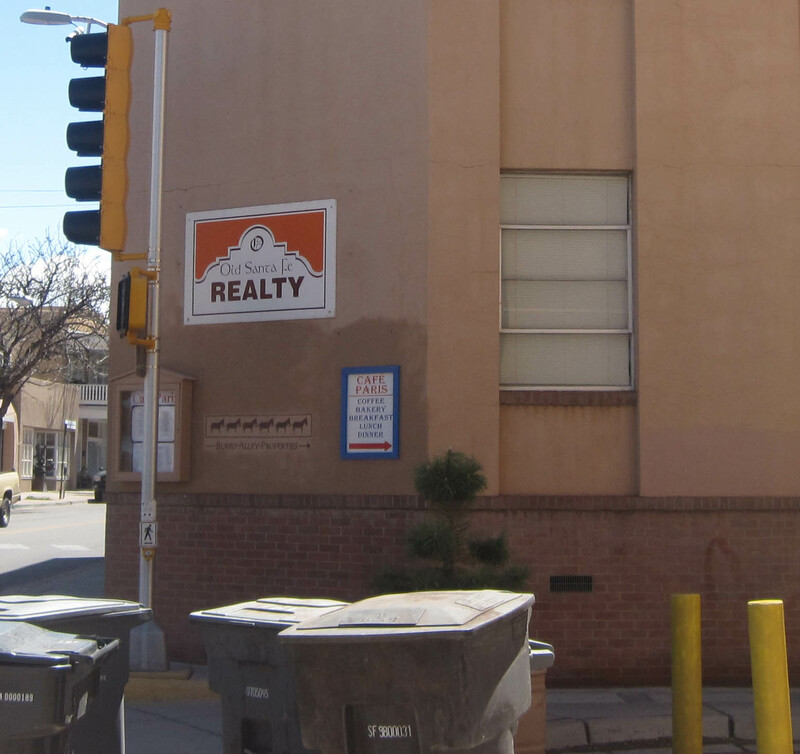 That is what people see when they say San Miguel is like Santa Fe – houses to buy and sell. A lot of films are made in Toronto with Toronto substituting for New York City. There is a story that to make Toronto look more like New York, the film crew scattered paper and rubbish around a film site and went to lunch. When they came back the city maintenance crews had cleaned up the mess. Toronto looks clean but Santa Fe is too clean to be real. It has been antiseptized to death. How can it say it has Mexican Heritage and look like that? Martha Stewart must have something to do with this. Look how neat and tidy everything looks. No dogs, no unlicensed vendors, no clothes being sold in a door way, no tortilla vendors cooking over an oil drum. Santa Fe is too clean to be fun. How can you shop like this? What bargain are you going to find? I don’t believe anyone in Santa Fe can have any fun. How can you have fun if you don’t get dirty or have to dig through things.? 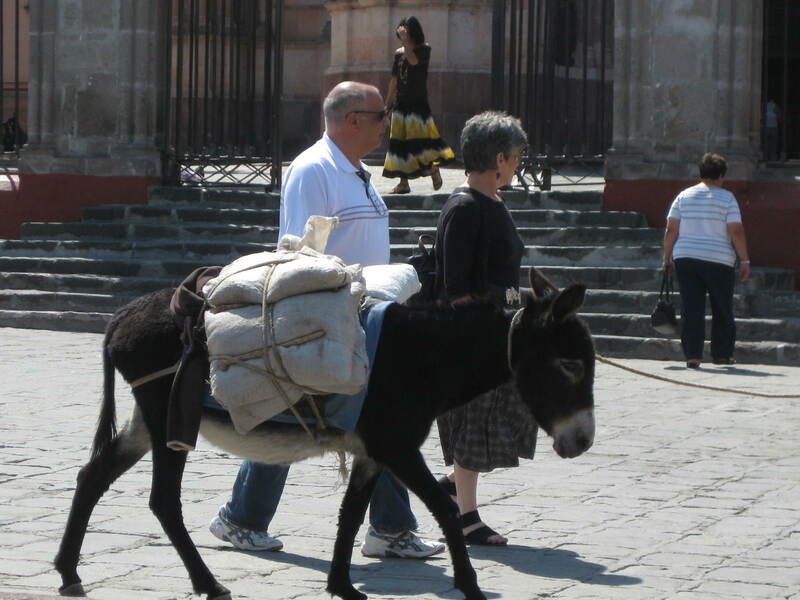 In San Miguel de Allende, burros are our friends. We take them everywhere with us. Woman have found that men are very useful as burro holders. 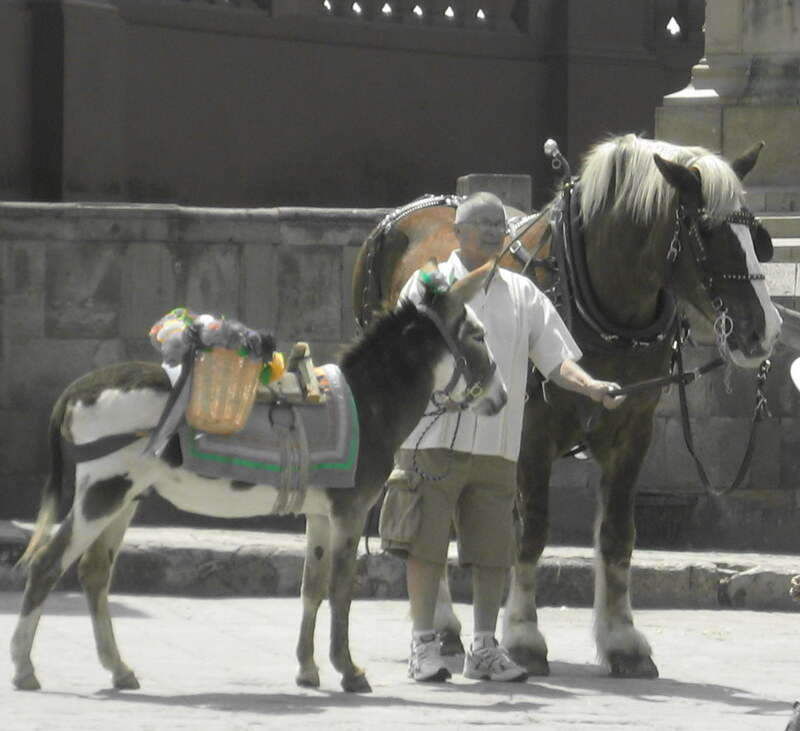 Some people have even adopted burros as pets. They tend to be a bit cumbersome at times but are useful in carrying wood and dirt and purchases. Santa Fe has it appears banned burros from the city. I have no idea how wood and dirt get to houses. The only burro I found was an iron burro. Could it be that Artists have taken the story of Lot’s wife and turned all the burros to Iron? Isn’t this taking Art a bit far? It all started with Christopher Columbus and where he thought he was going. 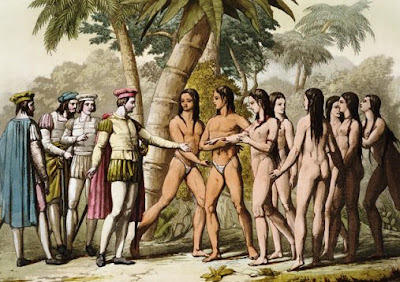 He thought he was going to India so he met Indians, although there appears to be controversy about what he actually wrote – Indios or In Dios and what India was actually called in 1492. I thought this a silly little dispute because I didn’t think anyone used the I word anymore. It is not politically correct. 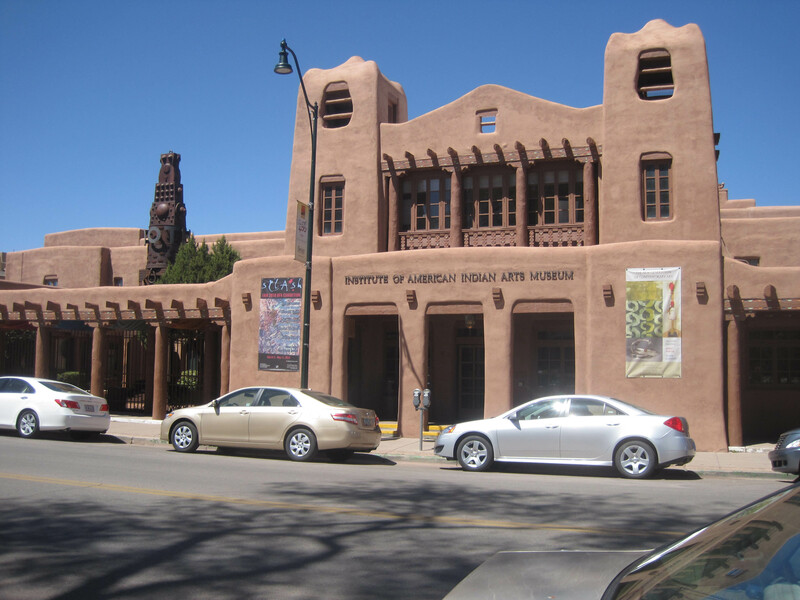 Imagine my shock when I arrived in Santa Fe and saw the I word on a Museum. I went to one of favourite sites on Ethnic Slurs and couldn’t find it there although I did find Injun. The term Native American is more politically corrected or referring to the Native American by their tribe name is acceptable. In Canada we use the term First Nations or aboriginal. 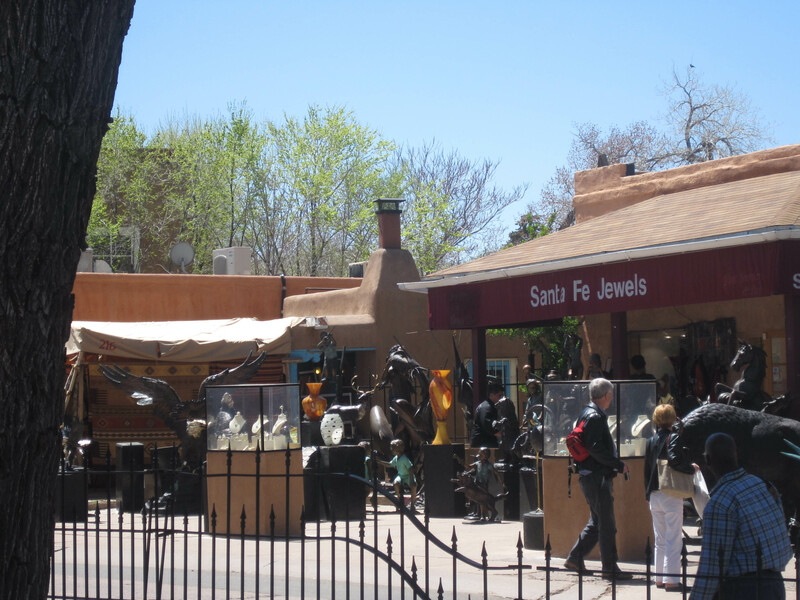 Here I thought Santa Fe was politically correct and I see the I word.
. Then I saw I word people selling Jewelry. In fact the whole town is full of I Word Art and the I Word is used all over town. At least San Miguel doesn’t use the I Word. We refer to the local people as maids and gardeners or as our friends. I have been to the Promised Land. 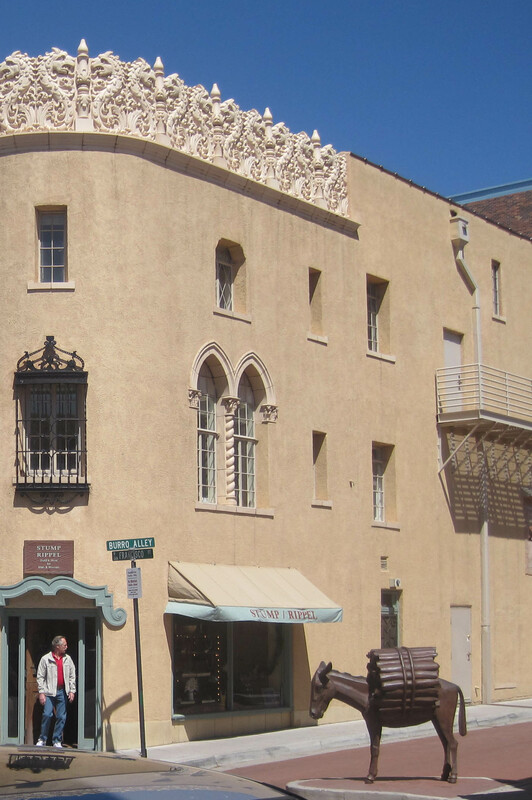 There are tales told in San Miguel of a Magical City in the US of A called Santa Fe. San Miguel de Allende is often called Mexico Lite or a Starter City for any first time visit to Mexico. The comment is usually made by a Gonzo Tourist who see travelling and travelers as a spectrum or a progression and themselves as the Everest of Travelers. They are the equivalent of the Religious Right or those Leftists (socialist in the US) who protest every G8/G20 meeting. At the other end of the spectrum are the Mexico Lite Tourists – who want to be in a foreign country but have it just like home. Any hint of foreignness challenges and worries. Between the Gonzo Tourist and the Mexican Lite Tourist is wide spectrum of tourists. It is all about a point of view and a reaction. This post is going to try to help you pinpoint where you are on the Tourist Spectrum. Look at this picture and answer the caption. Your reaction to the picture will give you some idea of where you are beginning to fall on the Travel Spectrum. Much of it deals with how you define adventure. Clothes Line or Clothes Sale? For the Gonzo Tourist, this is a shopping expedition. 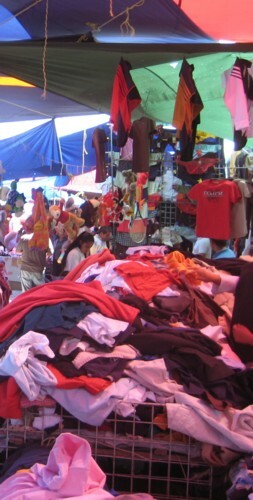 For the Mexican Lite Tourists shopping is only an adventure because purchases are evidence that you have been away. So continuing with Travel Spectrum Placement. Where would you shop? If you choose C, then you are definitely on the Mexican Lite side but all these pictures were taken in San Miguel so you can see there is a range offered to all tourists on the Travel Spectrum. 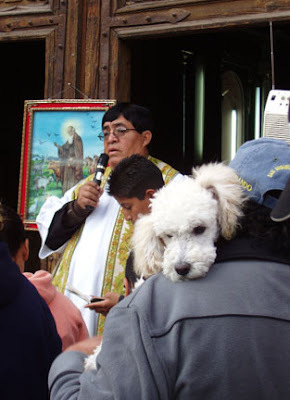 Yes you can visit San Miguel as a Gonzo Tourist but it is difficult. Potential Botulism or Taste Treat? Answer which way you would walk – towards the right or the left? Depending on your point of view are you walking from or towards Danger? For the Mexican Lite Tourist – danger lurks everywhere. Next question – what do you think this store sells? Masks for Robbers or Wrestlers? This is where fear starts to move you along the spectrum. If leaving Kansas means taking a risk then danger can be seen everywhere? This only gets more complicated when you travel. A Do I have to pay and will they take American? C Is this girl dead? See danger is in the head of the Tourist. The Mexican Lite Tourist would simply not use the facilities. The Mexican Lite Tourist can’t speak a word of Spanish but the Paranoia they feel gives them superhuman translation abilities. This is what they read. The next series of pictures work on the Charm Theme. Look at the picture and decide what you would do. Mexican Lite Tourist would see a source of diarrhea while the Gonzo Tourist would grab a plastic bag, fill it and eat everything unwashed. More shopping test – which is more charming? By now, you should have a good idea of which type of tourist you are. But yet another test. Would you plug your computer into this outlet? And do you view this house as a Fixer Upper or a Slum? In San Miguel, you can stay at the Best Western, shop at supermarket that looks just like the ones at home, eat at restaurants with English menus and never never have to experience Danger although it is only a Taxi Ride away. Mona Crewson, after her experience with the Cereal Robber and knowing he was in jail, became less vigilant. She set the San Miguel Alert to Blue and started to take chances such as walking down a path that, previously would have filled her with dread. That day, something happened that would alter Mona and lead to a new Good Works in San Miguel. Ahead on the path, her eyes caught a bit of color. At first she thought it was some Bougainvillia leaves but as she neared she could see it was a leg – a Clown’s leg. Her heart pounded as she bent over to pick up the small clown’s leg. She had loved clowns since the Circus had come to Toledo and here was a clown’s leg. Tears started as she began to search for the poor One Legged Clown. But there was more horror. In the bushes hung two little clown arms. They had been ripped off the one legged clown and thrown carelessly in the bushes by some heartless person. All the pain of her life collaesced at this moment and Mona fell to the path holding each severed part in arms and wept for her own little lost Clown. When she stopped crying, she knew that she has to make sure that this would never happen again to a single clown in San Miguel. She wanted to protect all the clowns in San Miguel and make sure they were in good homes full of love. So began the Sociedad Protectora de Payasos (SPP) or Society to Protect Clowns (SPC) with a goal to make sure that there were be no more dismembered nor unloved clowns in San Miguel, ever again – not on her watch. Her first goal was to stop the Clown Mills she heard were operating through out San Miguel especially before Lent. Here Clowns where turned out by the handful and sold to anyone. She and her friends went out into the community to document and photography the Clown Mills . Here is picture of a Clown Mill and someone from the SPP. The Policia seemed unconcerned so the SPP/SPC realized the only solution was to buy and liberate these little lost clowns. So the SPP/SPC started their own fundraising campaigns to raise money to rescue clowns. And set up tables in the Jardin to get the little clowns adopted. Every Thursday you can see volunteers, toting little clowns on sticks through the Jardin. You can adopt a Clown if you wish. These are such good people and such a Good Work.